1. Eat Mexican-Filipino pork adobo. On May 1, the team behind Casa Apicii and Bar Fortuna will open their latest: American brasserie Bowery Road and the next-door cocktail bar Library of Distilled Spirits. (Both are located at 132 Fourth Avenue.) Like Apicii, Bowery Road is meant to be a neighborhood place. That’s reflected in the all-day, crowd-pleasing menu, with its spiced banana bread for breakfast, jerk-chicken sandwich with mojo aïoli for lunch, and dishes like blooming mushroom (a bloomin’-onion riff) for dinner. Meatheads will also want to make a note of a pork dish that mixes and matches elements of the Filipino and Mexican versions of adobo. 2. Head to Mimi Cheng’s for a soup dumpling inspired by Daniel Humm’s roast chicken. It’s not every day that you eat a dumpling created by Daniel Humm. But you can every day for the month of May at Mimi Cheng’s, whose owners have snagged the chef for their latest collaboration. This is one to get excited about: It’s the NoMad’s famous roast chicken in soup-dumpling form, the kind of deluxe culinary fusion you can really get behind. 3. Get Tracy Obolsky’s varsity-level pastries in the Rockaways. Summer’s coming. For your first trip out to Rockaway this summer, go to Tracy Obolsky’s Rockaway Beach Bakery, which, after opening midsummer last year, now has an actual space at 87-10 Rockaway Beach Boulevard. Obolsky made a name for herself serving playful takes on American desserts at places like North End Grill and Cookshop, and that means you’ll be eating sweets that are made with fine-dining skills, with the added benefit of being on the beach. 4. And also check out the pastries (and sandwiches) being served at Café Altro Paradiso’s café. In West Soho, Ignacio Mattos and Thomas Carter have introduced a lunchtime only café menu at Café Altro Paradiso. There are small sandwiches ($8) ideal for a midday snack, like prosciutto and ramp butter on focaccia, and a demi-baguette with slices of medium-boiled egg seasoned with anchovies and chopped herbs. Speaking of top-tier pastries, Flora Bar’s Natasha Pickowicz — a rising star in New York’s pastry world — has brought her talents (and formidable sticky-bun skills) downtown. She’s also offering other sweets like a pistachio-butter cookie ($4), as well as a tasty cacio-e-pepe biscuit ($3). 5. 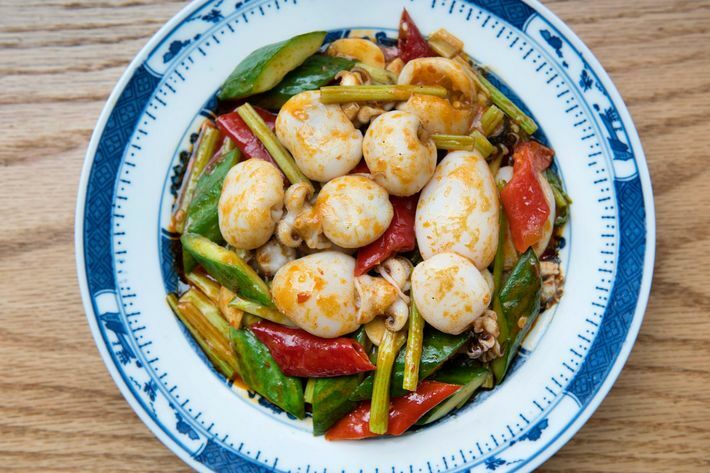 Eat real-deal Sichuanese food in Williamsburg. With Cafe China, Xian Zhang and Yiming Wang helped turn midtown into an unexpected destination for Sichuanese cuisine. The restaurateurs expanded downtown with the Shanghainese China Blue, and now they’ve crossed the East River into Williamsburg. At Birds of a Feather, Ziqiang Lu is serving traditional Sichuanese dishes like tea-smoked duck ($14) and cumin lamb ($22), alongside dishes like baby squid with pickled chili pepper ($18). Also in Williamsburg, on May 5, the guys behind the popular, scenic Loosie Rouge will open Loosie’s Café (93 South 6th Street), a daytime café serving matcha-spirulina doughnuts that morphs into a cocktail bar at night. 6. Attend a dinner and discussion about undocumented workers, featuring acclaimed chefs. South Philly’s Barbacoa has received national acclaim for its food (Bon Appétit named it a Best New Restaurant in 2016), and its chef-owners Cristina Martinez and Ben Miller have also been vocal advocates for the rights of undocumented workers. On May 1 at Downtown Art, they’ll come to New York to cook for the first #Right2Work dinner and discussion hosted outside of Philadelphia. Martinez and Miller will collaborate on the meal with La Morada’s Carolina Saavendra, Maison Pickle’s Harold Villarosa, Four Salt Spoons’ Yewande Komolafe, and others. Drinks will be sponsored by St. Germain, and the discussion on the lives of undocumented works will be held by Social Justice Lawyering Clinic director Jennifer Lee, chef Tunde Wey, and Cosecha’s Lucia Allain. Admittance to the dinner is (tax deductible) donation based, and the money that’s raised will help take the series national. 7. Catch a screening of Anthony Bourdain’s documentary about legendary chef Jeremiah Tower. After its debut last year at the Tribeca Film Festival, Zero Point Zero’s The Last Magnificent has finally premiered for the public. The Anthony Bourdain–produced documentary about Jeremiah Tower, directed by Lydia Tenaglia, explores the life of America’s original celebrity chef and his role in shaping modern American cuisine. Celebratory without glossing over the difficult aspects of Tower’s personality and life, it’s been earning lots of praise. Find out what the buzz is all about for yourself and head to the Sunshine Cinema, where it’s being shown throughout the day right now. 8. Hang out in one of Brooklyn’s nicest backyards, while eating great food and drinking amazing mezcal. Fort Greene’s Colonia Verde’s hacienda-like backyard is about as pleasant as it gets in this city. 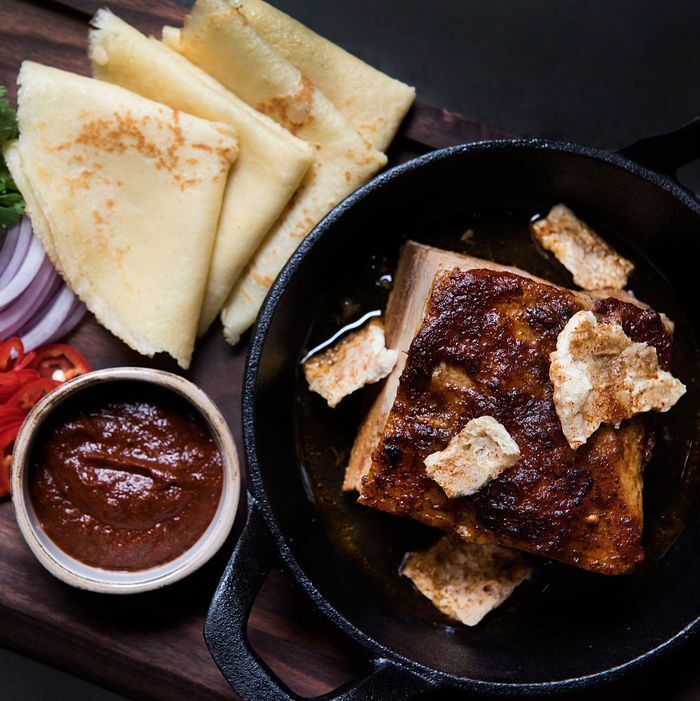 During summer Sundays, the owners host Sunday Asados, a sort of fancy, food-world backyard barbecue — bringing in great chefs from New York, around the States, and Latin America. The first one is this weekend, and it’ll be back again on May 21. The cook this round will be Monterrey’s Andrea Martinez, executive chef of Comuna, and the event will celebrate and feature women in Mexican food. There will be wines from Maria Rivero of Rivero González, Daniela Santos’s Caramela chocolates, and Yola mezcal. Tickets (food and wine included) will be available at $55 starting two weeks before the event, but can also be purchased at the door for $60. 9. Take a tour of the fantastic Indonesian Food Bazaar with one of the event’s key vendors. Elmhurst’s New York Indonesian Food Bazaar is extremely popular in its community, and famous among outer-borough food nerds. When the weather is good, it’s New York’s best place to slurp laksa and nibble on Javanese peyek, a deep-fried savory cracker flavored with peanuts and seafood (such as anchovies or baby shrimp). On May 6 from noon to 5 p.m., Culinary Backstreets will offer tours through the bazaar ($7.50 each) for groups of two to ten people. 10. Outdoor-eating season is back, so eat parantha downtown. Another option for eating outside this month: Bowery Market has added Smorgasburg veterans Parantha Alley to its lineup. The vendor specializes in eponymous Indian flatbread — which it offers stuffed with fillings like spicy ground chicken, potato, and green peas — and specials like spicy plantain and coconut, and bacon, egg, and cheese. 11. Make one last trip to Hudson’s Bonfiglio & Bread before it closes. Hudsonites and upstate weekenders were no doubt sad to hear that Bonfiglio & Bread, the charming and consummate small-town café, will close its location there and relocate to Athens, New York. There’s still time to pay a visit, though, as the café won’t close until May 8, meaning you’ve got one more weekend to visit the original store for some Roman-style pizza, cinnamon-swirl bread, and a few loaves for the road. 12. Check out a great New York bar’s new cocktail menu. Donna is one of New York’s most enjoyable places to drink, especially during summer, when the warmer weather better matches the bar’s breezy, tropical-ish look. Which is a good enough reason to head to the bar for, say, an excellent mai tai. An even better reason is that head bartender Karen Fu and her crew have debuted a new spring menu, with drinks like the Lions on the Beach ($14; Bimini and Plymouth gins, Avuá Amburana, pamplemousse, elderflower, coconut, lemon) and Wildberry Glory ($15; Del Maguey Crema de Mezcal, Monkey 47 Gin, Kina L’Avion d’Or, Lustau Vermut, strawberry).